Today is my first day of doing the Keto (ketogenic) diet again. I have been slowly weaning off carbs since the beginning of the year so that I could start Feb 1. Well, I'm a couple of days early. 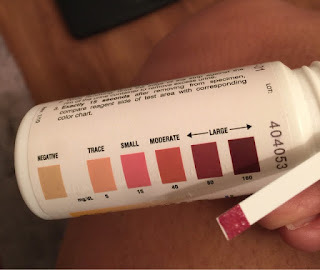 But according to my test strips, I'm already in Ketosis so just lowering carbs to 15% got me there. I have chosen this way of eating for several reasons. 1. It restores my sanity surrounding food. My cravings and hunger are gone. Eating this way helps me stay in control of what I eat. 2. I've successfully lost weight on this plan before. 3. Sugar makes me crazy, and I need to eliminate it from my diet totally if I'm ever going to be food sober. 4. Keto allows me to make this a lifestyle. There doesn't have to be an endgame. I CAN eat this way forever. I have NO appetite. I haven't been hungry in days. Now, this may have a little to do with the fact I'm back on my Advocare supplements (I'm still in my 24-day Challenge). Or it may be because I'm already in Ketosis. I was going to check today just to see how close I was but I'm already there. I've been at about 15-20% carbs for the past week or so, and I'm guessing that was low enough. Today I made a big breakfast (that I couldn't finish 😳). I did our taxes this morning (which was very stressful btw) and afterwards I NEEDED the gym. I worked out, did a little shopping, and got a pedicure. It was while I was in the pedicure chair that I realized... I forgot to eat lunch before I left the house. I got home around 4:30 and put my soup in the microwave and proceeded to start dinner. Around 6 pm when Clyde got home, I went to the kitchen to check on the chicken in the oven and realized I FORGOT TO EAT THE SOUP AGAIN. I ate a few bites, but I just didn't want it. And I just decided to wait and eat dinner. And I was fine. No headache. No hunger. I was ok.
And it felt significant. That I was able to have a Saturday with no hunger, no cravings. Feeling totally satisfied. All I had to focus on was drinking my water quota. This is how I want things to be. I'm tired of the struggle. This feels much easier. My goal is to stick with this way of eating until my birthday on May 26. It's a big one. 40. I will give this my all because I desperately want to have some success with food recovery and weight loss before I turn 40. I want to reach my goal weight this year. So Keto it is until then and I will reevaluate. But something tells me there will be no birthday cake involved! And that will be the ultimate victory. I'm 40 this year too! There is something very final about it - I really want to have done something with my weight by then as well. I think it is all the other stuff we can't control - wrinkles, grey hairs etc - weight is the one thing that we can! Good luck! I can't wait so see how it goes!!! I'm also on Keto and love it. I was on Adkins before, but find this is much better, faster, more satisfying and I'm hungry less often. Good Luck to you! I look forward to reading how your journey goes! Ending the binge cycle... And cake.